Maybe it's because these stones are not common in my area of the South. All I know is once I saw this stone, I became fascinated with the man it stood to memorialize. African American research is a whole different type than what I am used to; it's much harder. It's even more difficult once you hit the slavery period. I cannot promise what I have found is the gospel, but it's what I believe is the likely story. As is the proper path to take in genealogy, I will start with the death of Daniel Ryder. There is stone to the left of his that is partially sticking up out of the ground with no visible markings. Is this a random stone? Maybe it's a marker for Daniel's wife, Dilly Ann. Daniel is buried a good distance away from the rest of the individuals within the cemetery. I can only assume it's because of his race. I believe Daniel died between 1910 and 1920. "Separate but equal?" Here's a photo showing the distance. I was kneeling at Daniel's stone when I took the picture. This entry suggests Daniel was born about 1848 and married Dilly Ann about 1868. I could not easily find Daniel Ryder in the 1870 census. The prior records suggest he was married to Dilly Ann by that time, and possibly had one child. 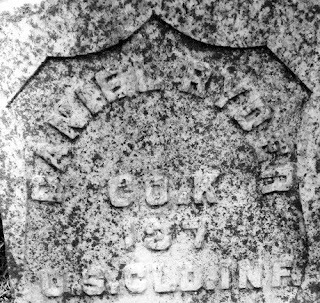 Between 1865 and 1866, Daniel Ryder was a private in Company K, 137 U. S. Colored Infantry Regiment. This regiment was organized in Selma, Alabama in 1865 and mustered in Macon, Georgia. Duty was in the Department of Georgia until 1866. Some units were assigned to cleanup and burial details in and near Andersonville. The recruits were mostly farmers, laborers, and ex-slaves. Sounds like Daniel was all three. Daniel can be found in the Soldiers and Sailors System as Daniel Rider. His name is on the African American Civil War Memorial in Washington, DC - plaque #E-139. Now, can we go farther back? I have a hunch Daniel Ryder was a slave owned by William Ryder of Houston and Bibb counties, Georgia. I'm going by the fact that many slaves took the names of their "masters" after emancipation. The fact that Daniel had a son named William might also be a clue. If I am correct, the 1860 Bibb County, Georgia Slave Schedule has William Ryder owning 9 slaves. One was a 13 year old boy. There was a 33 year old female, but no male around that age. The 1850 Houston County, Georgia Slave Schedule shows William Ryder owned 5 slaves. One was a 2 year old boy. There was a 40 year old female, but no male around that age. I believe the young boy in each of these slave schedules is Daniel Ryder. Aside from the horrifying fact that he was a slave, it does not appear that he was ever with his father. He may not have even been with his mother, though I do hope (even though the ages don't fit this theory) the older woman on each of these schedules was his mother. Unfortunately, it seems Daniel Ryder spent the first 17 years of his life a slave and apart from his family. I wonder if he ever was with them again. A somewhat interesting fact is that Daniel's one-time owner, William Ryder, and William's wife are also buried in Liberty United Methodist Church cemetery. This, in my opinion, further boosts the theory William at one time owned Daniel. After the research of Daniel, I can say I am still fascinated by him and his story. If there is anyone out there with any information about this man, I am certainly interested in knowing more about him. Especially if any corrections need to be made to the research I conducted, please let me know. Lastly, I thank Daniel for his service to our country. Hello. I wish I knew more about it. I saw the 1860 manifest and it saddened me to see that slaves names weren't even listed. I am glad to know this story. William Ryder was my great great grandfather.